As Baby West marks his 6 week birthday today smiling (hip hip hooray! ), I thought it would be appropriate to share what baby items have been noteworthy in getting us from day one until now. It's hard to catch a still, smiling, shot from this little flail-er! I realize that 98% of you reading this blog fall into the category of not finding this post of interest. But for that 2% of you all (Anyone? Anyone? Bueller?) who may find this information useful, this one's for you. 2) The Happiest Baby on the Block, by Harvey Karp. Also? Baby Wise: Giving your child the gift of nighttime sleep by Gary Ezzo and Robert Bucknam. My two favorite bibles, I mean books, for sorting out your child's wants and needs when your own intuition is not doing the trick. These books must be taken with a grain of salt however, and do not kick yourself (Tiffany) when your baby is not yet sleeping through the night at six weeks as the books suggest. 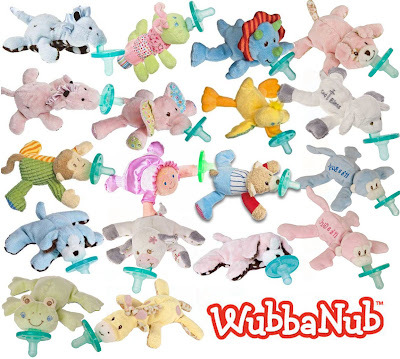 3) Wubba Nub pacifier. Sounds ridiculous. Looks ridiculous. Works wonders. The animal attached to the pacifier works like a weight to keep said ridiculousness in your baby's mouth. And bonus? It's easy to spot across the room, in the car or at the bottom of your diaper bag. 5) Plain white cloth diapers from Gerber to catch the spit up and drool. Your dollar will go far with these and they really do the trick better than any other burp cloth out there despite their less than fashionable appearance. 6) I am in love with my Petunia Pickle Bottom diaper bag. Admittedly a bit spendy, but totally worth it. Plus, I like to divide the total cost up by days used when I am factoring purchases like this. For example, at $160 dollars, if I use this every day for one year (and probably longer), the bag is costing me .43 cents a day. Not bad, right? The backpack feature is my favorite and lends an extra hand (or shoulder) for other things whilst corralling a toddler and a car seat in and out of the car all day. And, I would pay the extra $30 bucks or whatever it is for the "glazed" option. I have already given this thing plenty-o-thorough wipe downs and it still looks brand new. 8) The Moby wrap. Also a favorite. My only complaint is that when West is screaming his face off, wrapping this thing around my body like Houdini seems to take for-ehhhhhhhver. Still, I wouldn't write it off because it is indeed amazing. 9) Newborn outfits. I know that everyone says don't bother because they grow out of them so quickly, but what is your sweet one supposed to wear before that point? Weston is just now growing out of his newborn stuff and I am happy to have seen him in something other than a white onesie for the previous 42 days. Don't go crazy, but do invest in a couple of outfits. These pants. I die. Thank you to Shannon, for making them for us! 10) Last but certainly not least? Dr. Brown's bottles. For those of you fortunate enough not to use bottles or who prefer to go without them, more power to you. But for moms like me who need them, finding a good one is crucial. We cruised through the 'First Born' and 'Avent' brands until settling on these bottles of choice. Having a baby with reflux is no walk in the park but these make it slightly more enjoyable, as the airflow intake is reduced significantly with the "magic insert" as I like to call it. Thank you Dr. Brown, whoever you are. - Swings. Why are my children the only ones to hate these things with a passion may I ask? "My kid sleeps in his/her swing for hours," will never be words to come out of my mouth which is why ours is on Craigslist. - Sleep Sacks (not to be confused with Summer Infant Swaddle Me's, which I LOVE!). Go with swaddling. - T-shirt onesies. Full length won't hurt their newborn umbilical stump after all. - Wipe warmers, bottle warmers or anything else that your baby will potentially grow to love and will inevitably backfire on you the day that you find yourself without such item. What are your must haves that I should know about? !